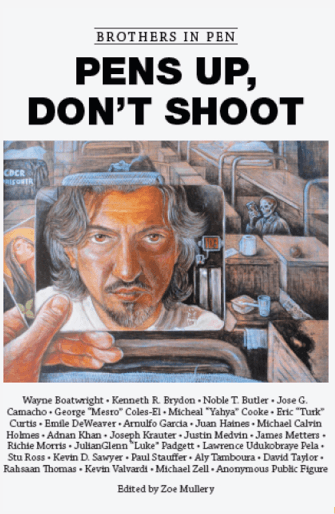 The title of the latest anthology in the “Brothers in Pen” series, Pens Up, Don’t Shoot, arose from the phrase protestors rallied around after Michael Brown was killed in Ferguson, Missouri in August 2014. So much has happened since then. This book’s first stories began to be compiled in 2015… but due to its editor’s molasses-like qualities, it was not finished until now. Please go to our blog, brothersinpen.wordpress. com to find out all about it! Please read it, pass this post along to announce its arrival, and if and when you have feedback, reviews, questions, or interesting thoughts about the stories, please post them as a comment here, or send it along to brothersinpen ••at•• gmail ••dot•• com. Writers love to get feedback. From the back cover: Brothers in Pen is the collective name of the writers in an ongoing creative writing workshop at San Quentin State Prison. This book contains selections of fiction in many genres: memoir, creative non-fiction, and some mutant hybrids… the common denominator being story. This is the ninth anthology produced by this class; as with Scheherazade of the Arabian Nights, the stories keep coming and keep enthralling. The Brothers in Pen invite you to participate in this book. Micheal “Yahya” Cooke: Extortion, Inc.